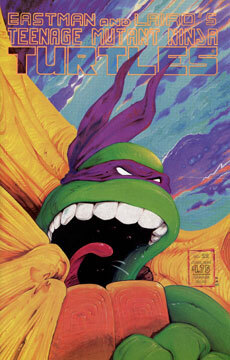 As the issue begins, the Turtles are ransacking their lair after receiving a bomb threat, shortly after their encounter with the Time Traveler girl from TMNT #16. The lads aren’t having any luck locating the explosive, but Leo is confident that the threat is real… as his “Turty Sense” is tingling. As Leonardo appeals to his brothers to continue the search, Raph grabs the TV remote out of boredom. As he clicks the button, Leo screams, “NO!” and then the TV launches a bomb out of its screen. Meanwhile, six years in the future, we see the young girl emerging from her time machine. She’s pleased to have arrived safely home, after her problems back in issue #16. She’s not so pleased to find a bizarro monster waiting for her (although it does offer her a cookie). The girl screams and flees her apartment, by crashing through a second story window. Fortunately, the monster completes an acrobatic catch and sets her safely to the ground, where the child bursts into another sprint. The creature then zaps the terrified child with a freezing ray and engages her in conversation. We learn that the alien is an ambassador of an alien race called the Skwal. His name is an unpronouncable symbol, so he goes by the name of “George.” We finally find out that the girl’s name is Dale Evans McGillicutty. George explains that Dale is in big trouble – as is all of humanity. The Skwal have been watching the planet Earth, attemtping to keep the human race from destroying themselves (unfortunately the aliens arrived too late, so things on Earth are already too messed up to fix). George has a particular interest in Dale, as she invented the time machine (although thanks to her manipulation of time, she actually didn’t – ah temporal anomalies). George needs Dale to use her time machine to go back 2 million years into the past and attempt to change the mindset of humanity, to make the species less violent and thereby giving hope to the future of the race and planet. However, the window of opportunity is closing rapidly, as the Skwal scientists only think that there’s one day left in the time machine’s life before it pops out of existence for good. The girl reluctantly agrees to go on the mission, but insists on taking some cargo with her. As Dale activates the machine, things go all higglety pigglety. Two million years in the past, Dale emerges from her time machine, and is quickly attacked by an apeman. Fortunately the girl has George’s raygun, and she freezes her ancestor in mid-leap. Dale explains to monkeyboy that she’s here to make his life easier, so he won’t be so violent and humanity will evolve into a more peaceful race. She teaches him about gardening and presents him with a comfy recliner. The Time Traveler also gives the apeman a mask of Jocko (an Australian actor who used to sell batteries in American TV commercials… very odd TV commercials), to protect him from predators. Finally, Dale gives monkeyboy a puppy, for him to snuggle and care for. Mission accomplished, Dale gets back into her time machine and heads for home. “In short, nothing to defend yourselves from the Invasoskwals! This great paradise will be ours!” the crafty alien finishes. “You tricked me! !” exclaims Dale. Things go haywire once again, and then we cut back to April’s apartment, where we find the Turtles returned to their old selves. As they celebrate with Casey Jones and Master Splinter, Mike’s soda can pops out of existence. As he asks if anyone saw it happen, April calls out to them to come quick. As the guys rush to find out what’s wrong, we see that April is watching the Pee Wee Herman show, and the secret word of the day is “turtle.” As Splinter laments the mess the Turtles have made of the place, everyone starts losing their memory… and then the TMNT and Master Splinter revert back into their original, non-mutated animal forms. Casey looks up from a crossword puzzle and asks April if she said something… in the final panel we see Ms. O’Neil delighted to find four normal turtles on her sofa.